London: Liverpool manager Jurgen Klopp tried to pre-empt questions about the Premier League leaders’ ability to cope with pressure after they again dropped points in the title race in a 1-1 draw away to West Ham on Monday. 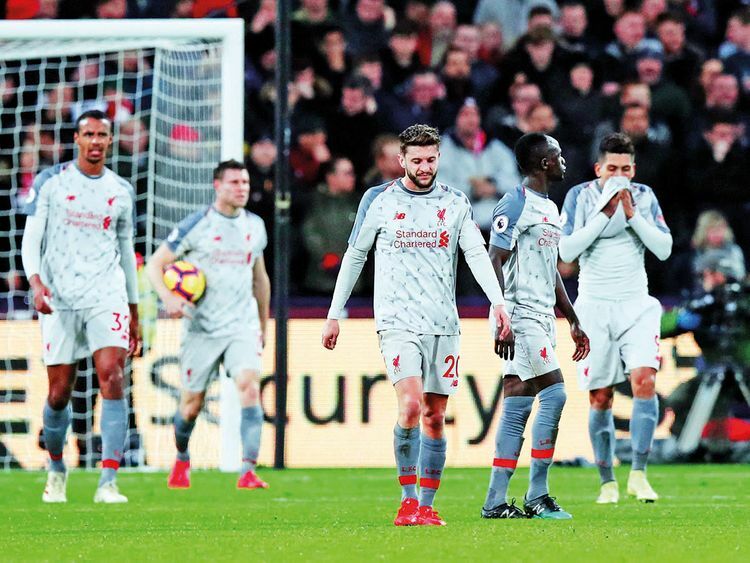 This result left Liverpool three points in front of second-placed Manchester City less than a week after they missed the chance to go seven points clear of the reigning champions. It was also the second match in a row that Liverpool had dropped points following a 1-1 draw at home to Leicester. Pep Guardiola’s City could now regain top spot with victory at Everton on Wednesday. “Probably all the reports are already written without me saying anything,” Klopp told the BBC. “I didn’t see anything about pressure that you can ask in the next few questions,” added the German, looking to become the first Liverpool manager in 29 years to win the English title. Sadio Mane gave Liverpool a 22nd-minute lead at the London Stadium despite Hammers’ complaints that James Milner was offside in the build-up. But Manuel Pellegrini’s men equalised just six minutes later when a clever free-kick caught Liverpool napping and Michail Antonio shot past Alisson. West Ham’s Declan Rice and Mark Noble squandered good chances but Liverpool substitute Divock Origi could have won the match with the last kick of the game — just as he did in the Merseyside derby against Everton in December. But Origi, offside inside the box, failed to get any power into a shot straight at goalkeeper Lukasz Fabianski. “It was a tough game,” said Klopp. “You saw around the setpiece, we knew about the routine but when we trained we had three other players in the team. “Apparently, our goal was offside and maybe the referee knew that in the second half. It’s a point and it’s a fair point. Meanwhile, Hammers captain Noble suggested his side had intimidated the Reds. “You can’t play man to man against Liverpool and out-pass them,” he told Sky Sports. “You have to keep your shape and stop them. “We scared them. You have to do that against the top teams.